In the era of today's investment opportunities using cryptocurrencies and blockchain technology for immediate transactions, we are able to offer our investors a certain profit of 4% per day. Our activities are focused on quick buy-and-sell transactions and arbitrage with cryptocurrencies. 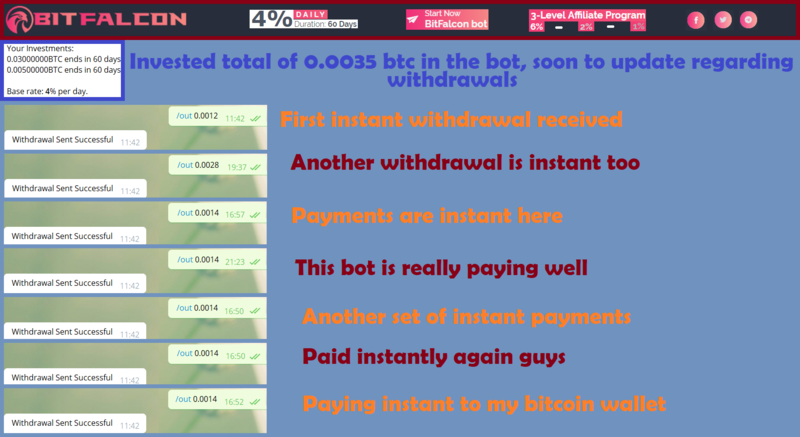 The methods we have developed, as well as numerous verified signals that we receive several times a day, make us able to guarantee the promised profits. Our investment plan assumes a profit with return of capital within 60 days (240% ROI). Последний раз редактировалось Rost77; 30.01.2019 в 21:24. Причина: Тема заброшена. Убрал реф. ссылку и перенёс в пролемные.